What Is The Fire Bible And How Is It Different From Other Study Bibles? It started out as the Full Life Study Bible; then it became the Life in the Spirit Study Bible. Now we know it as the new and improved Fire Bible. The study guides are what sets the Fire Bible apart from other study bibles. They have been called “an extensive reference library in one volume”. The Fire Bible has two editors listed: Rev. Donald Stamps and Dr. J. Wesley Adams. Their credentials are excellent. This is a perfect study bible for Charismatic or Spirit Filled Christians or anyone curious about all things spiritual. The study guides emphasize the spiritual side of things. Most people expect their study bible to be comprehensive and include all the information they are looking for. In the case of this bible, the study guides are written from a Spirit-filled perspective. The Fire Bible is authored by well-known spiritual leaders of our time who understand this. The Fire Bible is somewhat easy to use, but the plethora of study guides could be confusing. I would not choose this as a bible for new believers. The study guides were originally written for pastors and lay leaders. That tells me it is for experienced students of the Bible. Many special features make the Fire Bible unique. Themefinders point readers to 12 major themes of the Pentecostal tradition. What Are Some Strong Points About The Fire Bible? Any Weaknesses? Strong points are the versions available, the editions and bindings and the study guides. There is also the New International Version (NIV) written especially for children and youth, published in 2007. The King James Version (KJV) in large print published in 2015 is for those who still prefer the KJV. The Modern English Versions (MEV) was published in 2015. The bindings, paperback, hard cover, imitation leather, and genuine leather are pretty much the standard for all print bibles. Prices range from $19.95 for a paperback to $186.00 for genuine leather. Also, there is a Global Study Edition: New International Version published in 2010. The Fire Bible has two editors listed: Rev. Donald Stamps and Dr. J. Wesley Adams. Rev. Stamps attended Southern Nazarene University where he graduated in 1964 with a B.A. in religion and, in 1965, with a master’s degree in religion. He received his Master of Divinity degree from the Nazarene Theological Seminary in 1968. In 1989 he completed the study guides for the New Testament. It was published by Zondervan Corp. in 1990 entitled the Full Life Study Bible. Dr. Adams holds a Ph.D. from Baylor University in New Testament Studies. He is a contributor and associate editor of the Fire Bible. It has been published in over 40 languages and distributed on six continents. Possibly, the huge amount of study guides could be overwhelming for some people. What Alternative Bibles Are There That Are Like The Fire Bible? There is only one that I know of, The Spirit-Filled Life Bible, edited by Jack Hayford, published by Thomas Nelson Publishers. Pastor Hayford has an anointing of purity and grace, yet he is a strong leader filled with God’s Spirit. I believe he is a genuine pastor who is a true under-shepherd of Jesus and I highly regard his words. The contributors are strong Spirit-filled contemporary pastors and teachers, as well. Read our comparison of the Spirit-Filled Life Bible and the Fire Bible here. Originally published in the New King James Version (NKJV) by Thomas Nelson Publishers, it is now also available in the New Living Translation (NLT) and the New International Version (NIV). It is now called the NEW Spirit-Filled Life Bible as the study notes have been updated. It is available in Paperback, Hard Cover, Imitation Leather, and Genuine Leather. Colors of leather are black, burgundy and several others according to your preference. Various sizes are offered including one with “comfort print”. There is also an e-book available. Contributors include: Barbara Amos, Bishop Charles Blake, Reinhard Bonnke, Paul Cedar, Billy Joe Daugherty, Joy Dawson, Steve Fry, Joseph Garlington, Jane Hansen, Jack Hayford, Marilyn Hickey, Freda Lindsay, Bill McCartney, Lloyd Ogilvie, Fuchsia Pickett, Oral Roberts, Pat Robertson, Bishop Kenneth Ulmer, and many others. All study guides are written from a Spirit-filled perspective. 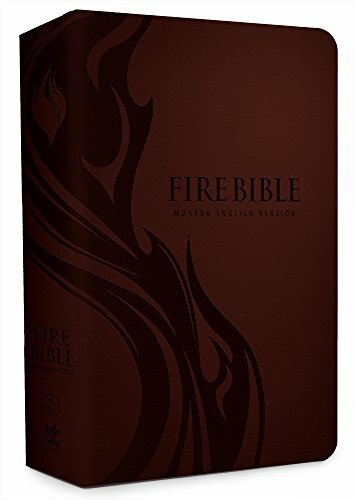 The Fire Bible is an excellent study bible for Charismatic/Spirit Filled Christians or for those who want to learn more about spiritual things. It is available in four versions and many different bindings and editions. The study guides are from a Spirit-filled perspective and have teachings on the Holy Spirit and His gifts to believers. Some prior Bible knowledge would be helpful before delving into this huge volume since the study guides were originally intended for pastors and lay leaders. If you want to know how to live a life that is close to Jesus and empowered by His Holy Spirit, do investigate the Fire Bible in whatever version you like best. It will provide an eye-opening and very rewarding experience! Next articleWhat Is The Best Bible Study for Married Couples?